My husband on occasion will state “Your brain scares me” and my reply is always “It scares YOU! Imagine, I actually live with it 24/7 and it scares the living daylights out of me”. The past 2 weeks has been like this. It’s been flowing with ideas for the blogs, ideas for work, mean people, volunteering for the my son’s highschool Parent Council, pay bills, re-organize the finances, do the paperwork, complete the contracts, who haven’t I called, who haven’t I seen, order diapers, and most importantly the Hearing Panel for Substitute Decision Maker. There are moments, which I have taken from Eckart Tolle’s “A New Earth“, whereby I actually say out loud “Shut Up!”. I literally am talking to myself out loud, telling my ego to just stop, give me a break, give it a rest will ya! I feel I have been so wrought with stress that I am overwhelmed and sadly I didn’t accomplish my commitment to two blog posts a week. But in the middle of that chaos in my brain, I actually noticed something very unique happening. I was in disbelief, but I kept watching to see if it actually is true and it was. Our dog who clearly cannot speak words was telling me something about Troy. Of course, you know this is Troy. Two years ago this coming April, I got my first dog. My husband has basically grown up with them. So we got Bishop, our Golden Retriever. Everytime, we came home, Bishop seemed so sad that we were gone all day. So this non-dog person (ME), decided her dog needed a dog. Just shy of a year later, on a Monday, we went to visit a Border Collie Mix, that had been rescued along with his two brothers from an abusive environment. When I first met this black fluff ball, he was shy, scared and wanted nothing to do with anyone. My husband told me, he wouldn’t be a good mix for our very busy family. The following night when my husband got home from work, Vegas was already purchased and in our home. It was Vegas’s eyes that told me a story that won my heart and I just knew, this is where he needed to be. It was a hard go with Vegas. He chewed everything, didn’t like being petted, scoured away, always frightened, and untrainable. He quickly became known as “Little S*T”. A friend of a friend was working with dogs and he came to us in September and has helped us with both our dogs and we have seen an incredible difference in our Vegas. (He was called Vegas for 3 reasons 1) his one leg looks like dice 2) we were told he was a Border Collie/Newfoundland Mix, so we took a chance on his size 3) Vegas holds a lot of meaning for my husband and I. Which all brings me to these past few weeks. Troy is not toilet-trained, as I have mentioned previously. We put Troy to bed around 9pm each night and then we sit and watch a show or play some online game, currently “Star Wars – The Old Republic“. At some point, we head to our bathroom off our bedroom and have a smoke (GASP, yes I smoke, along with a few other habits). Only during the coldest of evenings will we do that, instead of our garage. The best part is coming, so get over the smoking thing for me. When I leave our bedroom, I noticed Vegas is actually laying beside Troy’s closed bedroom door. This is not a place I would consider Vegas’s favourite spot. It’s usually on our bed, at the base of the kitchen bay window or on Troy’s couch. I am not quite sure when I caught on, but I did and it’s been consistent. When Troy has had a bowel movement in his diaper during the evening, Vegas lies beside Troy’s closed bedroom door quietly. Our Vegas is talking to us on behalf of our non-speaking son. Vegas trained himself through his sense of smell to tell us something. You need to realize this isn’t every night and holds no consistency and Vegas does not lay there any other evening. What an incredibly WOW moment for us. There are times when life provides us with a blessing and we are far too busy to pay attention. For the past decade, I have truly tried to slow down my life, and become even more aware of what life is telling me. Sometimes, with my very scary mind, it’s hard to see or hear it, but it’s there and it’s always inspirational. And as I proof-read this post, it only goes to show I have some work to do with my brain this weekend. It appears to be all over the place and I need to reign it in and focus. As you know Troy turned 18 on the 29th of September. There becomes a switch from Child Services to Adult Services with the Manitoba Provincial Government. Here we are about 10 weeks in and I have yet to receive my contracts for funding for Respite Care nor my time-sheets. I really dislike inefficiency. For me, I just fill out the Child Services time-sheets, and write in Bold Lettering across the face that I still do not have my Adult Contracts. We will see how long this lasts, as I refuse to follow-up with them. There mandate is to assist me. Working with Government Services for such a long time, one would expect you get use to the revolving door of employees. When I first moved to Winnipeg, I had an amazing woman named Genevieve. She went on a maternity leave during her time with us and her replacement was completely and utterly useless. She NEVER once returned a phone in the year I worked with her. The only exciting thing she did, was contact me to let me know Troy’s funding for a speech device was approved. Sadly, I did 99% of the work around that issue, as Troy had been forgotten one too many times and I took the ‘bull by the horns myself”. When Genevieve took a promotion, because of the caring style of her work, she recommended Ibrahim, who though an Adult Service Case Manager, he would have 18 months to get to know Troy before his 18th birthday. Poor Ibrahim went through a lot with us, but he recognized I won’t call him unless I need him, but when I do please be there. Ibrahim went through the nightmare of government approved renovations to our home and the red tape nightmare a family must go through. About a month after Troy’s 18th birthday, Ibrahim called me on a Sunday. Yes a government worker called me on a Sunday. My heart went to my stomach, as I knew what was to be said. Ibrahim and taken on a new position. Here we had worked as a team, and as I helped Ibrahim learn the Child Services area, I knew I could rely on him 150% once Troy was an adult. I truly am happy for Ibrahim and the fact he gave me the respect to call me on a Sunday, shows how much he cared for our family. So we begin again. I have a new Case Worker, to which I have yet to hear a word from, not even a 2 minute call of introduction. I understand that most of these employees are over-worked and probably underpaid, but that issue is not my issue. 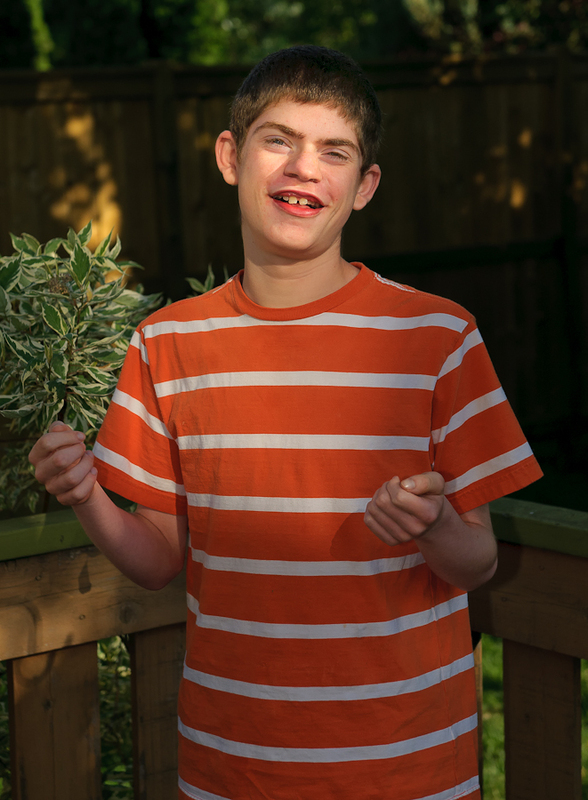 Their position that they choose in life is to be Troy’s Case Worker. Ibrahim has provided my new Case Worker with a brief history of our family and he has been advised I don’t take any bull. I expect what I expect without problems and I ask only for what I need. And to our past Case Worker, well he hasn’t really finished with us, as he still assisting me with the government application to be Troy’s ‘Substitute Decision Maker”, a process that takes 6 weeks, except it took them 4 weeks since receiving the application to call me and advice they are starting the process. I’ll keep you posted with regards to the change in Services, but so far as expected there is very little news coming my way. 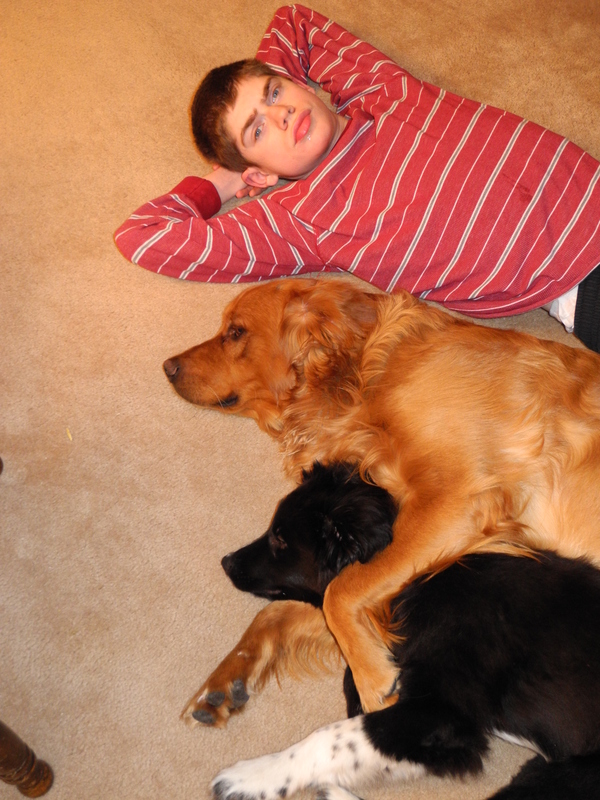 On a brighter note, here’s Troy and his two dogs; Golden Retriever is Bishop and Border-Collie Mix is Vegas.